So, a lot more than it felt like! I felt like I was swimming upstream most of the year, but it’s nice to see it all laid out like this. It was a year of new hair and new knees, and the loss of two family members. Sometimes it was all I could do to keep up with the house and garden, let alone sewing. It was a year when I really appreciated the blogging community, and the Twilters (Facebook and Twitter), and Twitter in general. It was a …memorable… election year. We’ll get through this together. And we’ll sew a lot. Revamp fireplace screen cover. Yes! Not including a picture because it looks much the same, but it is much improved, fits better, has much more quilting. Work on Scrappy Stars Around the Corner. No. I did not get to this. Make donation pillow cases. Yes! I made twelve. Make December blocks for Kat (?) Yes! Well, no, I didn’t need to make any, because it turned out that it was a Nov./Dec. challenge, and I had sent mine in November. Pull scraps for Charlotte’s new mystery quilt. No, but I decided on my background color, a raspberry solid. 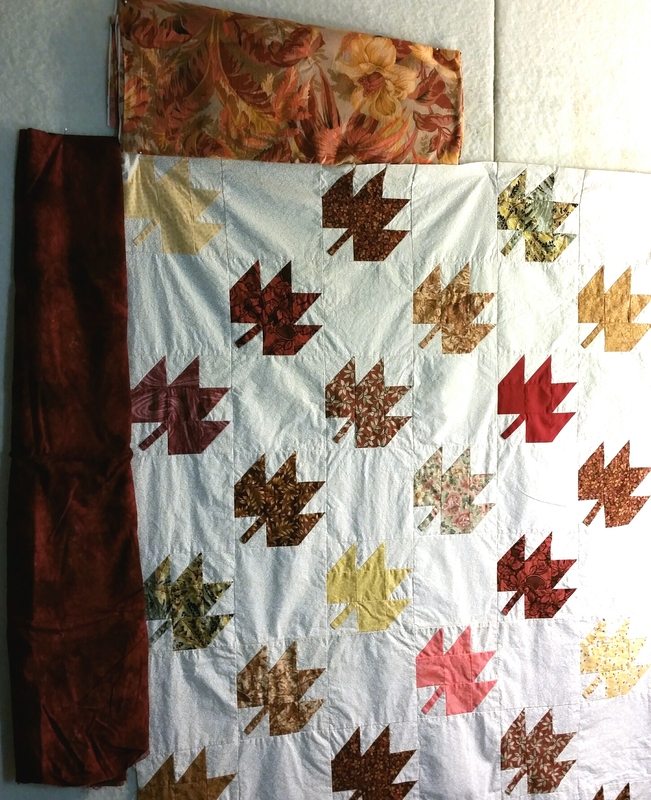 Bonus: I made two Maple Leaf quilts for donation. I will complete the large UFO quilt under my cutting table. It reminds me constantly that I abandoned it, so it takes up mental space. It also hogs most of the space under my cutting table, and is visual clutter in the room. First, I need to spread it out and come up with a better quilting plan than I had before. Then I need to mark, baste, and trim the batting on the back for faux trapunto. Then I can quilt it, etc. No, I did not do this. I just wasn’t feeling it. I did get an idea about cutting it down, since I hate how large it turned out. I will give my studio a good cleaning. It needs dusting, a little scrubbing, and the elimination of lots of extra stuff that has accumulated there. I also need to donate pillow cases and the baby quilts that haven’t sold. Yes! I did all those things. And hung a picture. I want to try to take another fifty yards out of my stash. This won’t be easy, because in the past four years I’ve gotten rid of 350 yards. There’s still some ugly less appealing fabric that I want to use up and partially replace with fresh stuff. One area that I can reduce is the scraps. I will continue to use them for quilts and donation blocks. I’m cutting soon for this year’s Scrapitude quilt, and Alycia and Kat have monthly blog drives for scrap blocks for good causes (Kat is taking January off). Yes! I just barely made it, but I did. And that’s without finishing Scrappy Stars Around the Corner! A pretty good month and a pretty good year, sewing-wise. In the next few days I’ll decide on goals for 2017 and post them here. It really does help organize things for me and helps me remember them! I’ve enjoyed reading your year-end posts. Happy New Year to all of you! Stay safe and healthy! See you next year! I didn’t piece these six-inch maple leaves, they’re from a top I brought home that my mother had pieced. I knew she’d be glad for it to go to a good cause. I was just going to add some borders and call it done, but it was already 48″ by 60″. This drive is looking for really small quilts (36″ x 50″ or so), so I took the top apart in the middle and made it into two quilts. These each finished at 40″ x 62″. I quilted between all the blocks first with the walking foot and fine thread, so they have more quilting than might appear. On one I quilted straight lines through the leaves and feathers through the blank spaces, edge to edge. 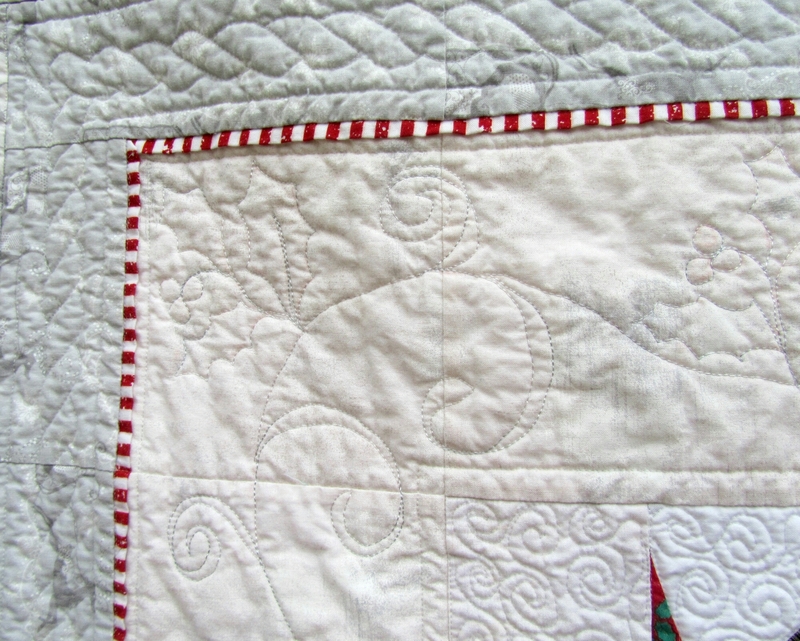 On the other, I quilted wavy lines to suggest wind, and then a feather border. My other finish this week is twelve pillowcases (here are six) to donate to Case for Caring (which used to be Conkerr Cancer). So, I met my year’s goal, just barely, but I did. We won’t discuss the vast amounts of fabric that are on order, but I’ll worry about that next year! Categories: Donations, Uncategorized | Permalink. My mother had a lot of gathered projects or ones with cut pieces and a block or two finished, but I didn’t I didn’t bring any of them home. I did bring this top of six inch maple leaf blocks (48″ x 60″). I’m auditioning these fabrics for borders. I may use them both. I love the colors in the print, but it’s tropical, which won’t show if I use it for a narrow inner border. The hand-dye print from Kona Bay is neither burgundy nor rust, which is why it’s still in my stash, but it’s perfect for this. I’ll finish this up for donation, and I know my mom would like that. Categories: Uncategorized | Tags: Evening in the Garden, maple leaf, Valerie Root | Permalink. No new fabric this week, and lots of usage. The Grungy Stars quilt used about 7.5 yards and alterations to the fireplace screen used another yard. How are you ding with your destashing? I’m liking up to the Stash Report at Patchwork Times. 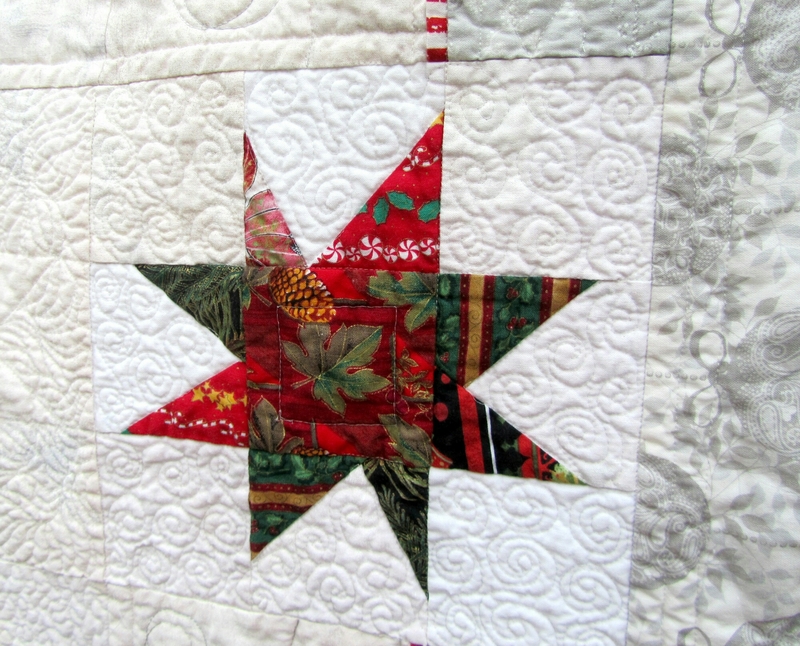 A while back I made a variety of wonky stars using Christmas fabric scraps. I put them together with lots of negative space made of various white and creamy Moda Grunge and borders of Windham’s Glisten. Then I took them apart and inserted a peppermint strip for definition. 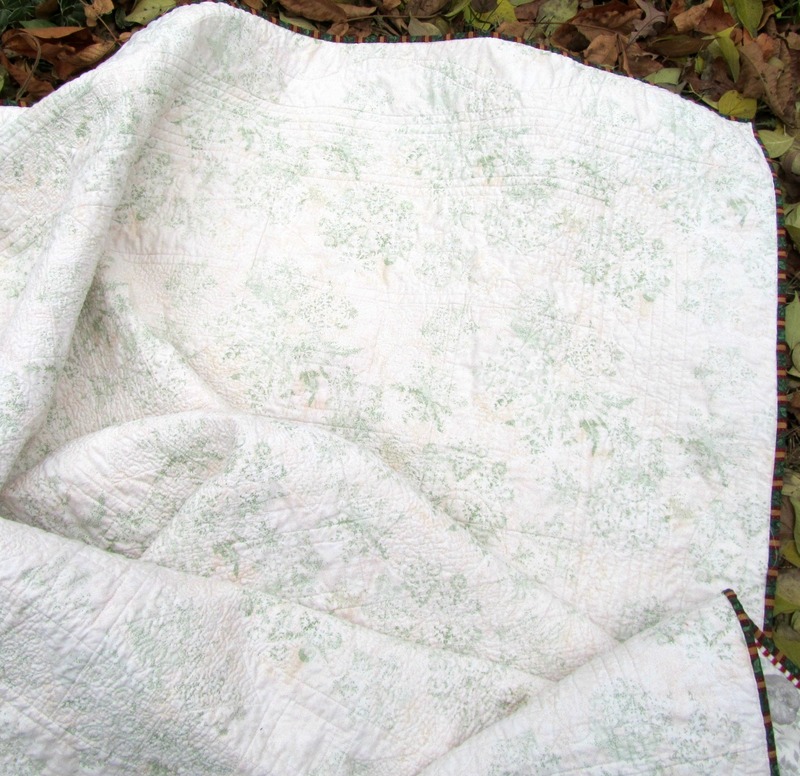 Oftentimes, after a quilt is washed I regret not having quilted it more. This was not the case. 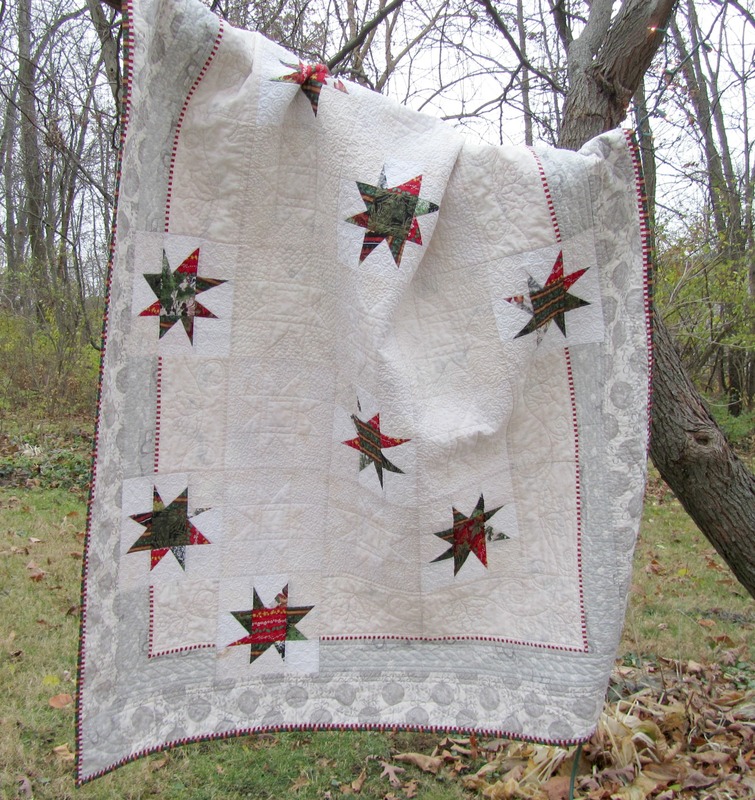 I quilted shadow stars in the plain blocks, and filled around all the stars in various ways. I quilted holly and ribbons in the first, wide border. 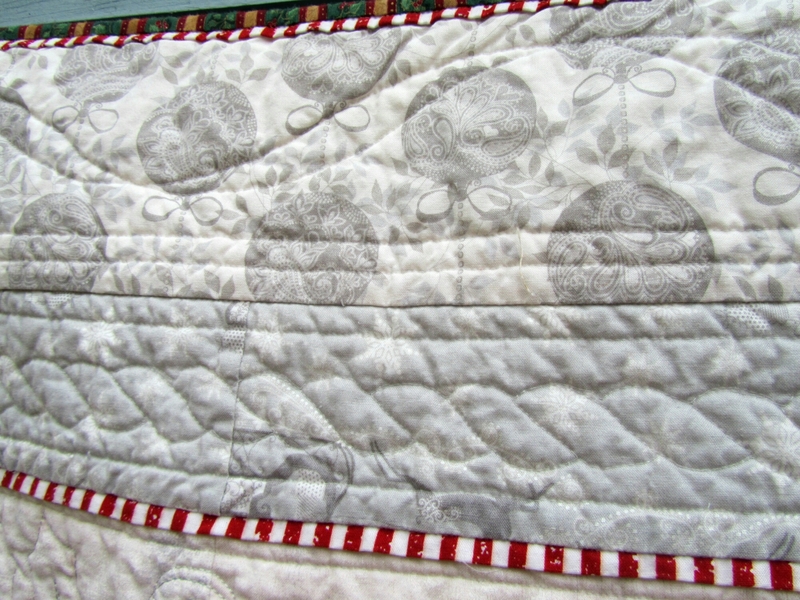 I quilted roping in the narrow gray border. After the fancy quilting, I went back with my walking foot and quilted straight lines wherever they fit to try to make the border quilting a little closer in density to the center. I didn’t succeed, but it’seems also pretty flat, so I think it helped. The back is a creamy batik with faint green snowflakes. This time I really think I accomplished the vision I had for this quilt. It’s here in my Etsy shop. Categories: Finishes | Tags: christmas quilt, Evening in the Garden, Glisten, Grunge, Leaves Galore, Moda, Sue Peland, Valerie Root | Permalink. Wow, where did November go? Thanksgiving ate up a lot of it. Well, I made this quilt, and some blocks. Finish Christmas quilt. Yes! Here’s a photo, and I’ll do a post soon. Revamp fireplace screen cover. No, but I’m going to do it soon. Work on Scrappy Stars Around the Corner. No. Maybe for Boxing Day Sew In? Make blocks for Kat’s November block drive. Yes, I mailed those off to her. Pull scraps for Charlotte’s new mystery quilt. Good luck on meeting your goals. Wow, where did November go? Thanksgiving ate up a lot of it. Well, I finished this quilt and a few blocks.